Does Having More Competing Groups Imply More Political Violence? According to the theory of outbidding, violent non-state actors have incentive to “advertise” their “services” through violence to capture a larger share of their audience’s support and resources. A natural conclusion drawn from this is that violence increases as the number of groups increases; the greater competition forces these groups to work harder to gain traction in their communities. While this literature is large and growing, empirical support for a connection between violence and the number of competing groups is mixed. Some large-n studies find that violence positively correlates with the number of groups. Some don’t. What explains this discrepancy? In a new working paper, I argue that a countervailing deterrence effect helps make sense of the mixed results. At present, outbidding theory only focuses on the competition between groups; it ignores the actions of the target of the violence. 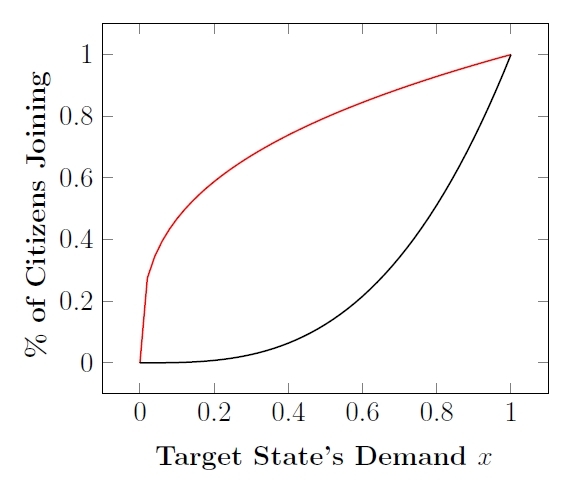 Nevertheless, the demands that a target imposes on an affected population influence recruitment rates, and groups have greater incentive to invest in competition when there is a larger pool of money to compete for. Thus, if a target observes a large number of groups and fears that competition will lead to massive violence, it may wish to withdraw from the problem area. This quashes the supply of recruits and reduces competition. In turn, a large number of groups can have a deterrent effect and possibly lead to less violence. However, it is unclear whether the deterrent effect or the competition effect predominates, so I model the interaction to look for answers. As it turns out, whether more groups implies more violence depends on a seemingly irrelevant characteristic: the function that maps encroachments from the target to civilian support for resistance groups. Naturally, this function should be increasing. That is, the more the target reduces civil liberties, captures additional territory, or expands its military into foreign lands, the more the effected population would want to support organized resistance. But the rate at which it increases could vary from case to case. Do the initial encroachments lead to a sharp increases in volunteer rates that slowly taper off? Then the function is concave, like the red line in the figure below. Or do initial encroachments lead to marginal increases at first but larger increases at later demands? Then the function is convex, like the black line in the figure. Surprisingly, the anticipated relationship between violence and the number of groups only holds when the function is convex (black line). The intuition is exactly as the current literature understands outbidding, so I will not explain it any further. The anticipated effect disappears when the function is concave (red line), though. The explanation is a bit more involved but makes perfect sense in retrospect. Imagine for the moment that the target state wanted to capture a small portion of the good under these concave conditions. This is going to spark a sharp marginal increase in the amount of violence it faces. Thus, if it is worth taking the first bit (and suffering a lot of violence), it is worth taking the entire policy under dispute (and suffering only marginally more violence as a result). So when the function is concave, the target’s optimization problem is a simple binary choice between taking nothing and taking everything. But recall that violence is increasing in the number of groups. Consequently, with more groups, taking the whole lot looks less attractive. In turn, when the number of groups is low enough, the target takes everything; when that number is high enough, it takes nothing. 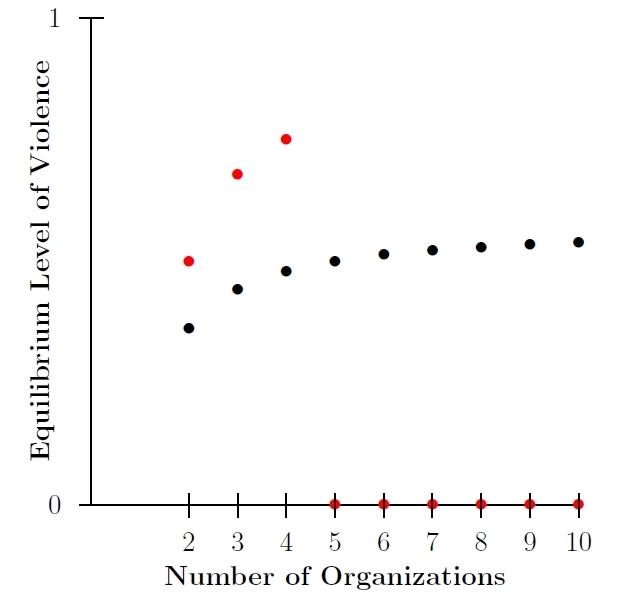 Observed violence as a function of the number of competing organizations. The red dots track violence when the function is concave, with black for convex. As the above figure illustrates, this leads to a nonmonotonic relationship between the number of groups and violence. Below that critical number of groups, violence increases as the number of groups increases. This is because the target is still taking the entire policy under dispute and the additional competition is producing increasingly more violence. But after that critical number, violence drops off because there is no civilian support for the groups to compete for. The remainder of the paper discusses the empirical implications of the model. The key takeaway here is that we need some way to measure these supply curves to obtain useful large-n estimates of the effect of the number of groups. There is no simple fix here, though foreign interventions are seemingly more likely to fit the concave (red) case. Again, the paper is here. If you have any comments, please send me an email! Abstract. The theory of outbidding states that terrorist, insurgent, and rebel groups use violence to capture a greater share of their audience’s resources. I argue that opponents of these groups should endogenously anticipate this dynamic, which potentially alters their aims. Although a seemingly obvious implication of outbidding is that violence increases as the number of groups (and thus competition) increases, I show that this may or may not hold once we factor in the opponent’s decision. This is because the target states—fearing group competition—might endogenously reduce their demands. The results help explain empirical inconsistencies regarding outbidding. Using comparative statics from the model, I then discuss the challenges to making valid inferences regarding outbidding.